Got up at 4:00 a.m. on Sunday morning, like usual, and checked the weather. Looked cloudy on radar but I don’t trust the weatherman. Went outside and looked up. Stupid weatherman was right, for once, at least in my neck of the woods. Decided to go out and shoot anyway since the radar looked similar to Sat morning which turned out to have some sun. Decided to head South this time to Bolivar as I haven’t been there is a few weeks. Not a good sign at the ferry with some flags blowing in a stiff wind. Got to the beach and saw that the waves were fairly high and decided that it was going to be a bust for bird shooting. Had someone following me driving on the beach so I decided to turn off and let them by. Headed down the beach again and saw what I thought was a dog taking garbage out of one of the garbage cans near the fence. Quickly realized that it was a Coyote. Pulled up fairly close with my bright lights on and watched him. Then decided that I should try to get a picture even though it was pitch black out with only my headlights for illumination. Said what the heck and then remembered that my camera was in the trunk. Decided to back up and drove backwards down the beach for a ways and then got out and grabbed my camera. Headed back towards him and he was luckily still there. Cranked the ISO up to 3200 and tried to get some shots after opening up my door and shooting between the door and the car. He apparently couldn’t see me with my headlights in his eyes. Got very slow shutter speeds. Moved the ISO up to 6400 and got off a few more shots before he ran away. It was very cool to see a Coyote that close. Just wish that it would have been after sunrise but I’m sure that he wouldn’t have stuck around like he did. Took this shot at ISO 3200 and 1/25 sec shutter speed. No noise reduction on this shot. Not a sharp picture by any means but decent enough for me to remember what happened. He had lots of garbage at his feet that I cloned out. I had seen animal tracks at Bolivar before and often wondered if there were any Coyotes around. Guess there are. Continued down the beach to the parking area, turned the car around and headed back to the ferry. 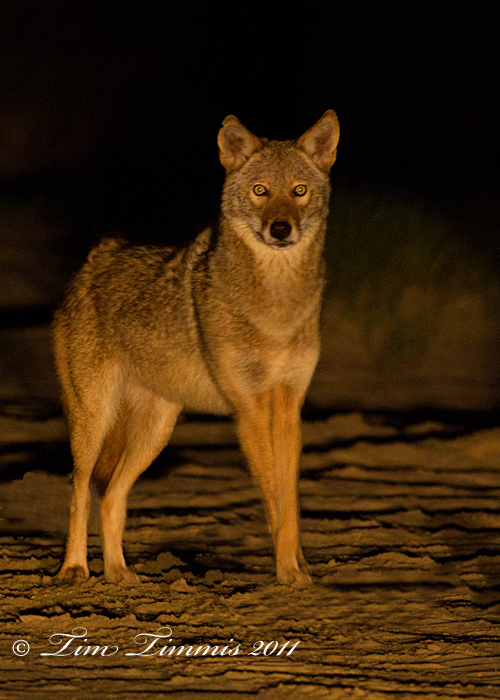 No birds for me at Bolivar that day but a cool encounter with a Coyote made the trip worth it.